AMA Tibetan is not far from JzP station, pretty close to the centre for tourists as well as locals. You’ll see the colourful bunting as you approach on the street, and the restaurant itself is in the basement. It’s nice and bright, thanks to lots of white paint and light wood, and really simple and elegant. The menu has one vegan starter, one vegan variety of momos, and two mains (one stirfry, one noodle soup). The vegan options are clearly labelled, so you can’t go wrong. Dr HH ordered the stirfry. As you can see, it was full of delicious charred broccoli and juicy mushrooms: he loved it! The waiter recommended getting rice with it, but we’re not sure this is necessary, as it was already a pretty hearty serving (plus we had a side as well). I went for the soup, and did not get a good photograph of it. It was a huge portion – I didn’t even come close to finishing it. It was advertised as a noodle soup, and, not knowing anything about Tibetan noodles, I was quite surprised when it was full of what seemed more like ripped up lasagna noodles. They were huge and delicious! I also got mushrooms and broccoli, along with pak choi and other green veg. 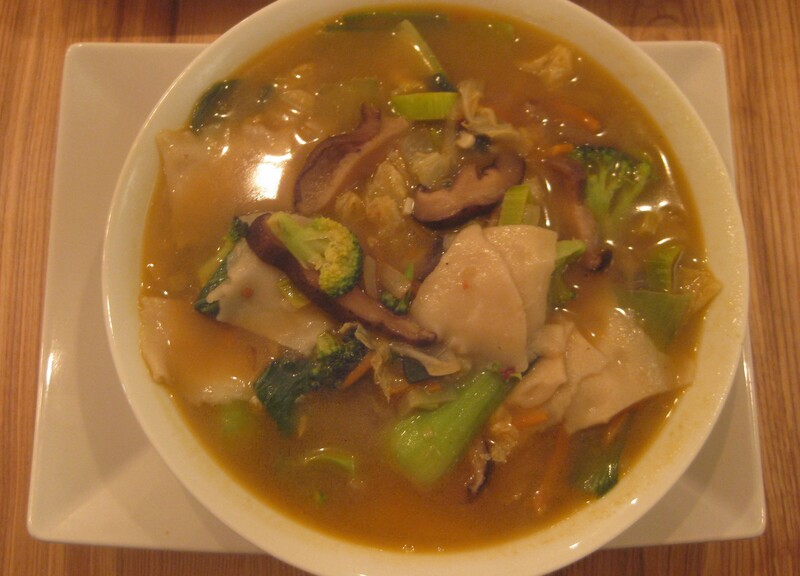 The soup had a nice kick to it, though I think the stirfry was actually tastier. Perhaps the reason I struggled with my soup and Dr HH didn’t need the rice was because we also ordered the vegan momos to share. How could we not?! We got ten little dumplings, which were perfectly formed, but unfortunately we found the veg filling a touch bland. Fortunately the dipping sauce (tomato and chilli, I’d guess) packed more of a punch and really elevated them – and was once again generously served. What a great place! Huge portions, generally strong flavours, lots of fresh veg, and guaranteed to please a crowd of veggies/omnis. Hurrah! 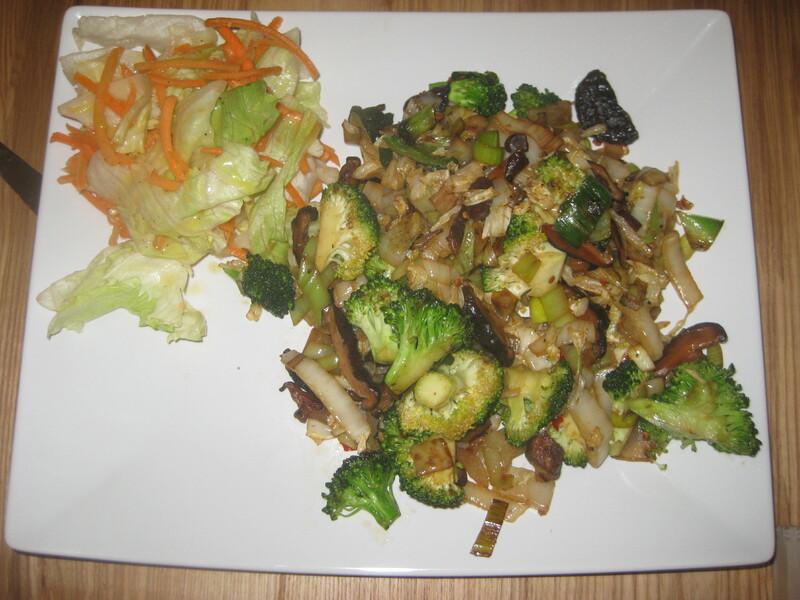 This entry was posted in Travel and tagged vegan AMA Tibetan, vegan Prague, vegan travel. Bookmark the permalink. Generous servings are two of my favourite words in the English language. 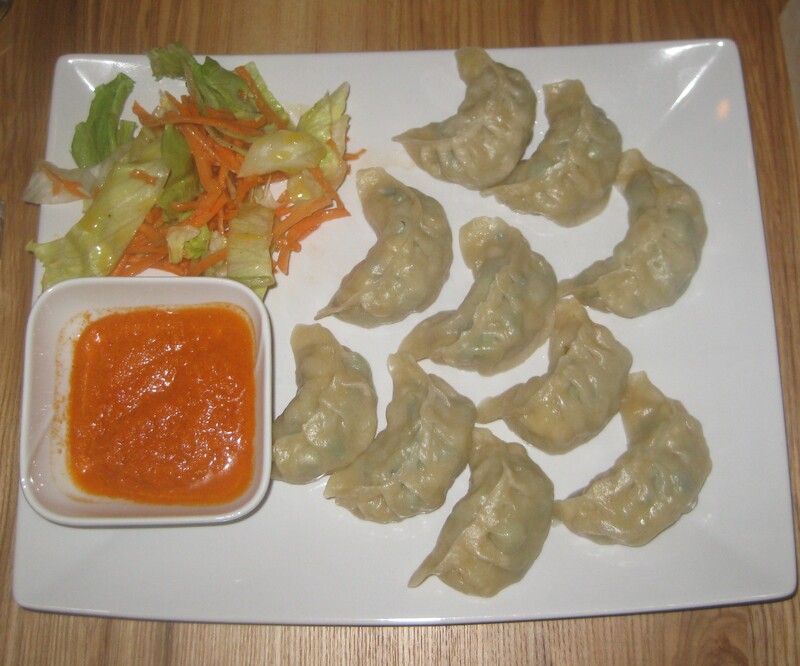 I’ve never had a momo before, but I’d be very happy to get my face around a plate of those dumplings. If you like gyoza, you’ll love them!